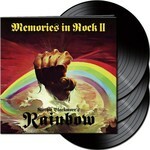 From cult hard rock band to singles chart success, Rainbow was the vision of one man- Ritchie Blackmore. 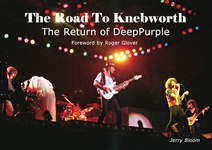 Created following Blackmore's departure from seventies rock giants Deep Purple he produced a spectrum of musical colour that fully reflected the band's name. 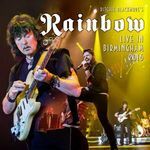 With an ever changing personnel, Blackmore's freedom from having his own band enabled him to control and steer the group in various directions that ultimately resulted in a string of successful hit singles. Amongst them 'Since You Been Gone', 'All Night Long' and 'I Surrender'.Visions of Rainbow celebrates the colourful lifespan with loads of rare and previously unseen photos of the band, on stage, in the studio, as well as close up and personal, including a section on the often overlooked period in the nineties when Blackmore briefly rejuvenated the band with new personnel, complete with narrative. 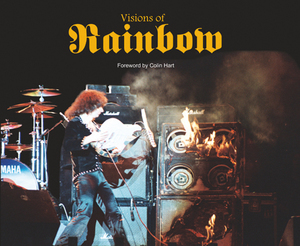 Beautifully presented as a large format hardback with slipcase, this book is an ideal addition to any true Rainbow fan's collection. 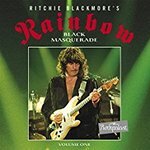 Features many previously unpublished photos of the band on and off stage from the seventies, eighties and nineties including previously unpublished photos from the recording sessions for Rainbow Rising, Down To Earth and Straight Between The Eyes. Plus personal photos of the band off stage, relaxing on holiday, and of course many great action shots from the band’s natural environment, the concert arena. 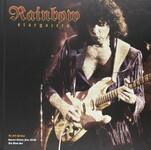 Although this is largely a photographic book, it does contain words on various aspects of Rainbow's career, as well as photo captions by Andy Francis, who wrote the sleeve notes for the official releases, Long Live Rock 'n' Roll, On Stage (remasters), Singles Box Set and A Light in the Black. Format: Hardback (210mm x 297mm A4), with slipcase. 128 pages. EDITORIAL CONTROL: This book requires total independent editorial control. It has not been authorised or approved by Rainbow or their management.